This superb Wedgwood porcelain pillar vase is an extraordinary example of the company's magnificent Fairyland Lustre line. Exhibiting fiery colors and scenes from a fantastical world, Fairyland Lustre pieces are among the most coveted Wedgwood porcelain. This vase is beautifully hand-painted on every surface, with the lush Torches and Tree Serpent patterns encasing the exterior. In the imaginative design, two torches light the way along a curving stairway to a shining white palace, while a dragon-headed snake inches up a tree toward a nest of helpless birds Completed by a fiery pattern encircling the base, this vase flawlessly illustrates the heights that Fairlyland artistry reached. First envisioned by Wedgwood artist Daisy Makeig-Jones in 1915, the Fairyland line was vastly different from the factory's usual repertoire of neoclassical designs and subdued colors. Makeig-Jones' work was rooted in fairytales, and her designs burst with brilliant colors, coming alive with scenes of nymphs, elves and fairies romping through enchanted forests and make-believe lands. Makeig-Jones retired in 1931, ending the reign of Fairyland, though today these works remain highly sought after by collectors. Features Wedgwood stamp and pattern number Z5360 circa 1920 Measures: 5 1/2" diameter x 11 1/4" high. A trumpet-shaped vase in black Fairyland lustre, decorated with the butterfly ladies pattern. At 10”, this is the largest of the three sizes in which this vase was produced. 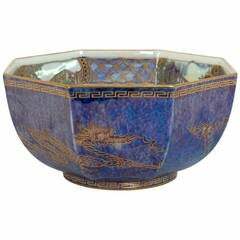 An octagonal fairyland lustre bowl, decorated with Geisha pattern, one of the best loved of Daisy Makeig-Jones’ designs.